IQ Option is one of the most popular brokers, which managed to make binary options trading available to everyone. IQ Option has high quality service, lowest deposit, and maximum return on assets – up to 91% in case of correct prediction. In 2015, IQ Option won the title of “Fastest Growing Binary Option Brand” awarded by Global Brands Magazine. Same year, IQ Option was voted as “Best Binary Options Broker” by reputable research institute IAIR, which shows how much industry experts trust this innovative broker (all awards list is available on iqoption.com). Our team has done a great job by making an IQ Option review for you, because we know what it takes to find a really good binary options broker in nowadays reality. Before writing the review, we spend some time to analyse forums, websites and other user reviews and in general we have spoken several times to IQ Option managers face to face on such conferences like the London Financial Partners Expo and Amsterdam Affiliate Conference. We believe that in the UK IQ Option is one of the most innovative and trustworthy brokers on the market at the moment. In-depth review including information about the trading platform, bonuses, available assets, history of the company and other important IQ Option facts are provided below. Broker IQ Option (IQOption) started its work in 2013 with main office based in Cyprus. IQ Option brand is owned by IQ Option Europe Ltd. Company was the one of the first to be launched in this industry in Russia, and still has office in Saint Petersburg. The fundamental work concept incorporated western business principles, which gave a great opportunity for everyone to become a trader of binary options, whilst providing full high-quality support to its customers throughout the cooperation. IQ Option has been designed to use for anyone who is not really technically savvy, and their trading platform is perfectly suitable for experienced traders of stock and financial markets. Meanwhile leading managers of the company continue to work very closely with experienced and professional traders, who help IQ Option to improve their services every day. The broker currently holds a license from CySEC (Cyprus) that enables IQ Option to lawfully provide all financial services on the territory of the United Kingdom. Trading binary options on the IQ Option is held on the trading platform exclusively developed by the broker. The trading platform itself is represented as a high technology web page, which allows you to trade and use all the financial instruments within the web browser. The trading platform is equipped with a very convenient side menu through which you can quickly switch from trading turbo options to classic trading options of longer expiration. Also, through the side menu, you can quickly contact support or login into your account. The algorithm of the trading is maximally simplified. Interface of IQ Option trading platform is very user-friendly as you can intuitively find anything you are looking for. You can change the chart type (Line, Area, Candlesticks or Bars), background colour (you can use black background which really makes it much comfortbale to trade at night) and there is also an option to simultaneously open up to 9 graphs, honestly, we haven’t seen such option with any other binary options broker. Another advantage of their platform is that they have wide variety of indicators and other graphical tools which will help you to perform technical analysis directly on the platform rather than opening separate window with TradingView or MetaTrader 4, which are widely used by traders. What we also liked is the ability to fully customize the platform for your needs, you can always have separate area for your open positions, or leaderboard statistics to be up to date with your positions in tournaments (*Subject to Terms & Conditions) in which you participate, or follow latest market news which are frequently updated by professional analysts of IQ Option. The broker provides the ability to trade so-called “turbo options” expiration time of which ranges from 60 seconds to 5 minutes (profitability up to 91% in case of correct prediction), and the classical binary options with expiration time ranging from 5 minutes to 1 year, which has the percentage return ranging from 70 to 91%. There is also an opportunity to close you trades (sell option) before the expiration time is reached for a small fee depending on the market behaviour and time left before the expiration time. Let’s be honest it happened to every single professional trader that he opened a trade by mistake… with IQ Option you can cut your losses by using prescheduled deal closing option. Remember that IQ Option fulfilled the request of their active traders and has made it possible to download the trading platform directly on the computer, which usually works a bit faster than the browser version. It is not complicated to register on IQ Option – all you need to do is go to iqoption.com (General Risk Warning: The financial services provided by this website carry a high level of risk and can result in the loss of all your funds. You should never invest money that you cannot afford to lose. ), fill in a registration form with your personal details and start trading. IQ Option offers three types of accounts: demo account, account to trade for real money or VIP account. There is also a variety of currencies available depending on your country of origin or your preferences, you can open an account in GBP, USD, AUD, NZD, RUB, CAD, EUR, and CNY. Sign up process is similar to registration on any forum or website, so you won’t have problems with that for sure. It is important to remember, that in order to open real money account you will have to verify your identity. Verification is a usual procedure of any trustworthy broker who is compiled with regulatory requirements of Financial Institutions to fight with money laundering as well as protect other clients from fraud. To verify account with IQ Option all new clients need to provide a photocopy of their identification document (passport, ID card, driving licence) which has photo and personal details. Also, IQ Option may ask you for additional documents to further verify your ID and your personal address, the following documents may be requested: utility bill, latest bank statement, band card scans or for example screenshot of your eWallet personal account if you are performing a deposit via Neteller, Skrill or Webmoney. It is important to note that IQ Option has smallest minimum deposit in the industry which is just 10 British Pounds or equivalent in any other currency you choose. In addition, minimum investment starts from £1, again, comparing to other brokers who have £10 or even £20 as a starting investment IQ Option has great advantages among other brokerage companies. * Deposit process is usually immediate whilst withdrawal process takes up to 24 hours. Speaking about the bonuses, at the end of year 2016, IQ Option got rid of the all deposit bonuses due to new regulatory requirements from CySEC. Nevertheless, broker still holds competitions, both for new and for active traders. For example, there are weekly tournaments for traders who like turbo-options, with the prize fund of $250. So even if you don’t have a big starting capital but have do understand how markets work, you can compete in trading tournaments (*Subject to Terms & Conditions) and start winning some extra money! IQ Option is that type of broker which strives to be leader in all niches of the industry. Broker always tries to be innovative and develops one of the most unique technical solutions within the binary options industry. Believe us, we are not just trying to praise the broker, as you can look up the ratings and ranking in different aspects. IQ Option Mobile App is for example one of the most downloaded trading application available for both Android and iOS smartphones/tablets. Company has managed to achieve such results thanks to talented UI & UX Designers and IT guys who work almost 24/7 to make IQ Option applications perfect. Most of the binary options brokers don’t invest money into mobile apps at all, due to the fact that their trading platform is not developed in-house, but rather bought from some other company who is responsible to produce both Web and Mobile versions. IQ Option Mobile App is very user-friendly, has almost the same interface as the web-version of a trading platform, allows to trade without any delays and doesn’t “eat” a lot of mobile data if you wish to trade on the move using your 4G network. * General Risk Warning: The financial services provided by IQ Option carry a high level of risk and can result in the loss of all your funds. You should never invest money that you cannot afford to lose. Technical Support of IQ Option works very quickly, while trying to solve problems cold blooded of any complexity. Customer service works 24/7 and available both via phone (+44 20 3318 7173) and special ticket system, almost like chat, but with approximately 10-25 minutes’ response time. Problems with payments did not arise, and the withdrawal of money usually takes up to 24 hours (no delay in funds withdrawal). Also, do not be surprised if you will receive a call from the manager of IQ Option, as they give you a couple of tips on how to use IQ Option trading platform, or just ask about how was your day – they are keen on working personally with every client. This approach may initially seem a little strange, but you should be very pleased that the company cares about you. Security wise, IQ Option has a financial licence from CySEC which means that there are a lot of rules they have to follow. When it comes to your personal funds, then you can be sure that they are very safe with IQ Option. Broker has special compensation fund, which was created specifically for “dark” days, in case something happens to IQ Option, it is called Investor Compensation Fund, which is based in Cyprus. Also, IQ Option stores clients’ money in separate to company’s bank accounts, which helps to segregate funds and lower the risk of frauds or any other Force Majeure. IQ Option is one of the fastest growing brokers in the industry of binary options and we would definitely recommend them if you are keen to trade on financial markets IQ Option provides high quality services for binary options trading, whilst adding new technical features into their own unique trading platform almost every day! The choice of many newcome traders falls on IQ Option, because of the small deposit only of $10 and a very small price of any option – only $1. If you look at the average minimum deposit and the option price in the market of binary options, it is 200 and 20 dollars. 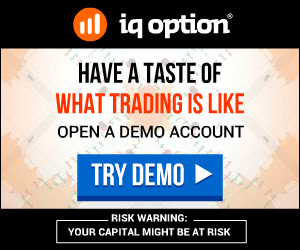 IQ Option has absolutely FREE demo-account, their own educational centre, and very qualified staff which further highlights the broker among competitors. Furthermore, it’s important to highlight that IQ Option is fully regulated by Cyprus Security and Exchange Commission (CySEC license no. 247/14), which makes it completely legal and safe to use them for trading. * General Risk Warning: Binary options trading carries a high level of risk and can result in the loss of all your funds. ** Note! IQ Option doesn’t accept traders from USA, Canada, Australia, Japan, Russia, Turkey, Israel, Syria, Sudan and Iran.